The bull put credit spread is an option trading strategy that is normally employed when you are bullish about an underlying stock, index or future. Since you believe the price action in the near term is going north, you use this credit spread strategy to take advantage of option time decay theta, otherwise known as "positive theta". The strategy uses only put options and consists of the sale of an equal number of closer-to-the-money options and purchase of further out-of-the-money options, both with the same expiration months. Because the closer to the money options will normally be more valuable than the OTM ones, you receive a net credit to your account from the transaction - hence the term "credit spread". Before entering a bull put credit spread you should first understand how option implied volatility (IV) affects the current price of options. The reason for this, is that you would prefer to sell (write) options that contain at least an equal amount of IV to the options you are purchasing. You don't want your bought options to be over-priced. More IV for the sold options is better - but not less. If the IV of the further OTM put options is greater than the closer to the money options, it could be an indicator that the price of the underlying has topped out and is due for a retracement. Why? Because more speculators are buying these OTM put options so the demand is inflating the price. The total risk for a bull put credit spread is the difference between the strike prices of your spread, less the credit you receive. Unlike selling naked puts, the OTM bought puts effectively cover you from almost unlimited losses. 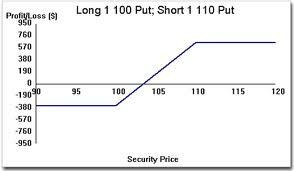 If selling put options is like offering others insurance on their investments, buying puts is like taking out insurance on your insurance - reinsurance. When analyzing a bull put credit spread you should assess the risk to reward ratio and should not accept anything less than 20 percent. In this regard, the number of days to expiration date will also be influential. Since the whole point of the exercise is to take advantage of option time decay, you should aim to enter the position with a maximum 6 weeks before expiration. During the last 30 days of an option's life the positive theta, or time decay, accelerates - and this is what you want working for you. One of the serious advantages of bull put credit spreads, which makes the low risk to reward worthwhile, is the ability to adjust your positions if the price of the underlying moves against you. When it comes your credit spreads you are able to "roll up" or "roll up and out" your positions. The first involves closing out the original credit and opening a new one with higher strike prices, while the second is about the same thing only choosing a later expiration month. (5) A large move downwards. If the price of the underlying does 1,3,4 or 5 above, your positions will profit. Only when the price action makes a large move against you, will option time decay not help you. In cases like this, it is important to understand the art of adjustments. By using the option greeks as your guide and trading by the numbers, you can manage your positions in such a way that you ensure profits on a regular monthly basis. 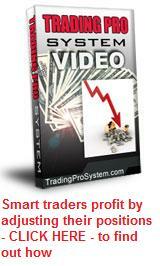 take a look at the Options Trading Pro System - over 24 hours of video instruction plus a valuable series of secret "wealth building" option techniques.